Light duty truck sales might be down for the year, but the Ford F-150 remains poised to be the best selling vehicle in the US yet again this year. Thanks to aggressive incentives, the truck market is experiencing sales roughly on par with those of one year ago. While gas prices remain tolerable for the moment, the lessons of a price spike have been learned and, as a result, Ford is refocusing its F-Series trucks for its core customers – the people who use them out of necessity. The result is an F-150 with more available storage than before, new and innovative cargo management options, a refined interior and powerful software and navigation options that prove useful to both everyday drivers and contractors alike. Naturally, efficiency has come to the forefront of design and Ford has managed not only to strip weight from the F-150, but has also added a six-speed transmission and optional SuperCrew SFE model that can achieve up to 21 mpg highway. Couple that with a comfortable, modern cabin that can be decked out with anything from barebones cloth to plush leather with wood trim, heated and cooled seats and premium sound, and you understand why the F-150 has done so well for so long. Labeling the F-150 as “highly customizableâ€ would be a gross understatement – the combination of 35 different cabs, beds and trim lines means there’s an F-150 for everyone. Space management has been meticulously thought out and is arguably superior to the competition. Cross-country trailer haulers will appreciate the 5.4-liter engine’s class-leading towing capacity of 11,300 lbs, as well as its optional integrated trailer brake controller. The rough ride of the FX4 creates a dilemma for those who want a daily driver with off-road capabilities. The brake pedal has a good amount of travel in it and isn’t as confidence inspiring as one might hope for in such a large, heavy vehicle. Some interior plastics, such as the gearshift housing, feel low budget in the high-end Lariat and Platinum models. Around town, the F-150 is surprisingly nimble, with properly weighted steering that’s neither numb nor too heavy resulting in good, consistent feel. Punch the throttle and you’ll get an earful of the big V-8’s bellowing vocals, but back off it uses its inside voice, as if to avoid interrupting the quiet cabin. Wind noise has been reduced nine percent and road noise is down five percent, furthering the in-cabin comforts. Acceleration is brisk thanks to the closely-stacked ratios of the new six-speed transmission, though the four-speed in the base model still feels as if it’s being asked to stretch its legs a bit too much. When equipped with four-wheel drive, the F-150 is an off-road menace – traction control isn’t overly intrusive, and is automatically switched off below 25 mph in 4H and the rear differential can be electronically locked in both 4H and 4L. Three separate engines are available for the 2009 Ford F-150. The base engine is a 4.6-liter, two-valve V-8 that produces 248 horsepower and 294 lb-ft of torque and is equipped with a four-speed automatic. A more powerful, freer breathing three-valve 4.6-liter V-8 is also available which makes 292 horsepower and 320 lb-ft of torque, driving the wheels through a six-speed automatic. If that’s still not enough, an E85 compatible 5.4-liter V-8 with 310 horsepower and 365 lb-ft of torque is available with the six-speed automatic. All engines can be mated to either two- or four-wheel drive. A lot of attention has been put into the towing capabilities of the F-150, and trailer-hitching amateurs will look like seasoned veterans thanks to trailer sway control and a tow/haul function that holds gears longer uphill and downshifts when the brake pedal is tapped to take advantage of engine braking downhill. Inside and out, you’ll find more than 30 storage compartments. Surprisingly convenient is the integrated box side step – a “booster stepâ€ of sorts – that properly complements the pullout tailgate step introduced in the Super Duty. We really like the optional rearview mirror integrated backup camera, which is more intuitive than traditional dash-mounted camera screens. New for 2009 is the in-dash computer with productivity software, including Crew Chief, which lets fleet managers digitally track and manage their trucks and equipment. Ford’s voice-activated next generation navigation system with SYNC can be added as an option and is amazingly capable, providing you with everything from trivial information like sports scores to more important commuter features like local gas prices and real-time traffic. A Sony premium audio system can also be specified, representing F-150’s first branded sound system. For a “work-orientedâ€ truck, the F-150 is surprisingly 21st century. This year fuel economy went from being the tenth most important purchase decision for truck buyers to the third most important. As a result, mileage has been improved by an average of eight percent across all powertrains. In two-wheel drive configuration, the 4.6-liter four-speed returns 14/19, the 4.6-liter six-speed manages 15/20 and the 5.4-liter does only slightly worse at 14/20. When equipped with four-wheel drive, the 4.6- four-speed, 4.6- six-speed and 5.4-liter engines return 14/18, 14/19 and 14/18 respectively. All engines are rated LEV-II. Cabin ergonomics have improved over the outgoing model, and overall material fit and finish are impressive across all trim lines. The Crew Cab has been extended six inches to increase rear legroom, and the B-pillars have been moved back to aid driver visibility. While the large, flat front-end of the F-150 appears rather blunt, the overall aerodynamics of the truck have been improved. It’s blocky, sharp-edged exterior evokes an overall sense of utility and purpose. 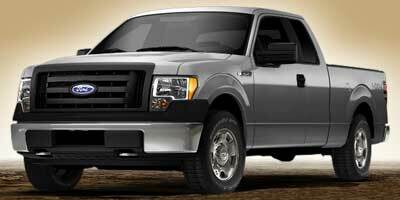 The XLT’s Super Duty-esque front grille is especially rugged. Just as the F-150 has increased in capability for 2009, so too has the price of admission. Prices start at $20,345 for the base-model XL, increase to $33,630 for the popular FX4 Off Road model and top out at $40,440 for the top of the line Platinum model. With so many different models and configurations, working out all possible pricing combinations would require a team of NASA engineers. Competitors include the $22,390 Toyota Tundra, $19,550 Chevrolet Silverado and the newly refreshed $22,170 Dodge Ram. Times change, and while gas prices mean light duty trucks may no longer be viable as a daily driver, many consumers still need them for business, towing and hauling. For these essential users, the F-150 should not be overlooked. It manages to blend utility and convenience with a level of refinement that proves difficult to match. Ironically, in a world gone mad over compact, hybrid and electric cars, the pickup is better than ever.